Mozilla is about the make a big mistake, the same as that made by IE7. Zooming the whole page is not a good idea. 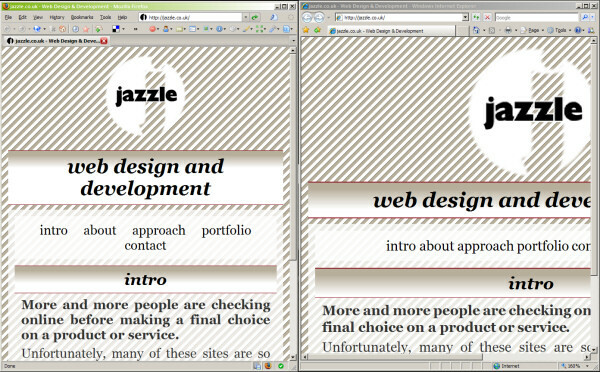 Current Firefox text-only zoom on the left, IE7 on the right. Using the current Fx way you can easily read the text without having to scroll sideways, but the new way (which is how IE7 works) means you have to scroll right for each line of text, then back to the left, and so on. I simply cannot fathom how they thought this was the right move. How about giving it a try before slamming it? In my experience it doesn’t result in a lot of horizontal scrolling. It’s not just a static magnification. It’s a zooming of text and images within the flow of the page so that for most pages a few levels of zoom doesn’t result in any horizontal scrollbar. Also, if you’d tried it, you’d see that there’s a menu item for text-only zooming so you can keep on keepin’ on with the way it was. Well, that’s me told, apparently by one of the big guys at Mozilla. Personally, I’m not going to try the beta version of the browser because I’m lazy. When v3 does come out of beta I will review this. Not a big guy (except in the “somewhat overweight” sense of the phrase.) Just one of the literally thousands of people that make Mozilla happen. I hope you do try it when 3 is released. I think you’ll actually find that for most cases it works really, really well and when it doesn’t, there’s the exceedingly convenient “Zoom text only” item right there on the menu. I’m going to have to admit that my blog article was sorely under-researched! I will definitely use Fx3 when it’s out, I’ve long been a fan (and user) of the product (and Mozilla Thunderbird too), and as a web dev I need to use a variety of browsers, though Fx with Firebug is the best debugging platform for me. Thank you so much, Asa. The latest version of Ubuntu came up about a month ago, with firefox 3 included. I was so angry about the new zoom I switched to galeon, but you’ve given firefox life again: “Zoom text only”. And you’ve taken a worry out of my mind, because galeon also uses Gecko, so it will have the new zoom sooner or later. Wish you lots of nice things! !